The archival materials brought together in the "Heritage Archive Gallery" engage history as a medium with which to forge new architecture. These diverse works selected for this collection share an architectural approach defined by a commitment to creating new public spaces, introducing natural light, and re-establishing legible navigation in response to careful consideration of past and present conditions. The sectional drawing of the Sackler Galleries speaks to a pioneering approach in which a subtle yet striking insertion into the existing built fabric reintroduces natural light and sensible circulation. Sectional sketches of the original mouldings and rafters of the Royal Academy of Arts explore how the addition of new materials and environmental systems will compliment historic elements. The Reichstag Rennovation constitutes a multi-scalar architectural project of marking a new beginning for the capital of a reunified Germany. 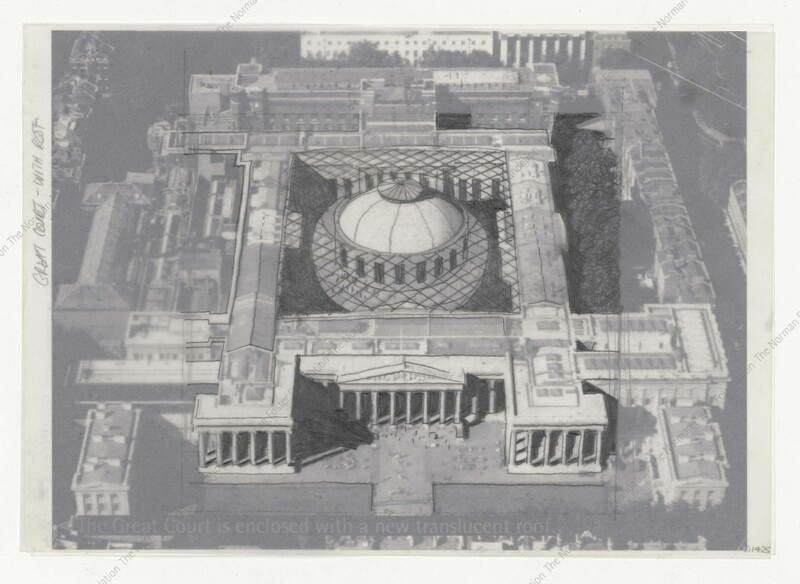 The sketches for the Reichstag Renovation document its evolution from a scheme that proposed placing a rectilinear canopy over the existing Reichstag to the realized multifunctional cupola. 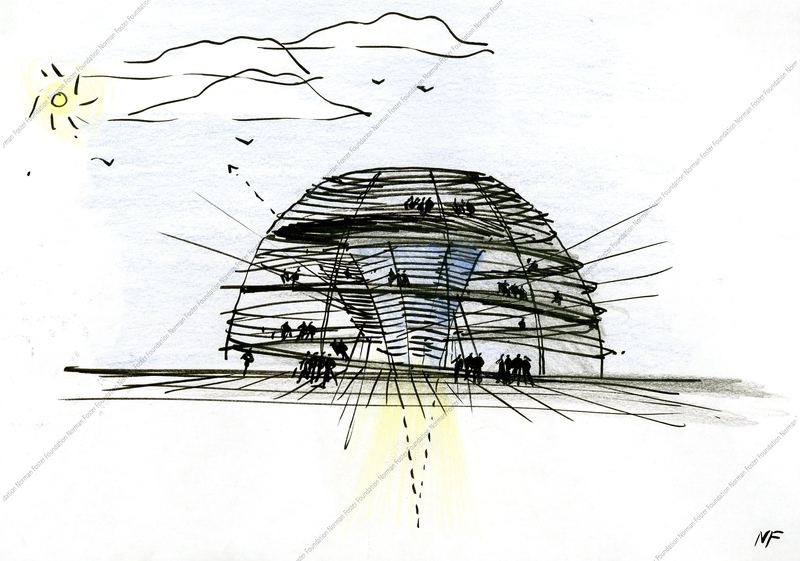 The process drawing suggests the way in which this cupola contains visitor ramps which surround a mirrored core to direct light into the space below. The sectional scheme for the Reichstag Rennovation integrates the new cupola with the existing structure in such a way that visitors symbolically preside over the governing chambers below. The Reichstag Renovation further introduced a myriad of strategies to dramatically improve the building's ecological performance. In addition to creating a new built German icon for reunified Germany, Norman Foster was asked to design a new emblem for the German Federal Parliament. The project's scope thereby reached from the broad creation of an icon for reunited Germany to the hundreds of study models undertaken to create a new double-sided eagle, that accommodates viewing from both inside the Reichstag chambers and outside the building. The lightweight envelope of the Library for the Berlin Free University realizes elements of Climatroffice collaboration between Norman Foster and Buckminster Fuller. The Library sketches and models suggest the way in which desks are placed at the perimeter of tiered levels under a double-layered skin that drastically reduces energy consumption by filtering natural light and introducing natural ventilation. As seen in its large sectional drawing, the Great Court at the British Museum was conceived of as a central heart to the labyrinth museum and a continuation of the urban space beyond the museum's walls. The tessellated glass roof simultaneously provides bright communal space, public access to the domed Reading Room, and new functional spaces seen below the courtyard in the sectional model.